Peace Walker Has The Stuff Of A "Masterpiece"
Metal Gear Solid creator Hideo Kojima cannot be clear enough. Metal Gear Solid: Peace Walker isn't just some PSP game. Oh no. Kojima has called Peace Walker a "MGS5-class game" — it was later revealed that Peace Walker was going to be called Metal Gear Solid 5. The game is all Kojima's idea and just because it is on the small screen, that does not mean it's a small game. 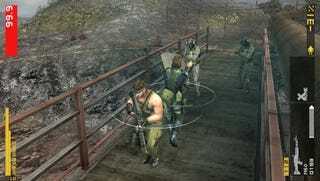 The MGS4 team is working on the game, which Kojima is supervising, designing, producing, directing and editing. In a recent interview on Twitter, Kojima once again explains that, yes, this game is a big deal. "Peace Walker has been announced for the portable, and it's not a spin-off, but a canonical entry in the MGS saga," Kojima tweets. "Of course, I put tremendous effort into the story." "The story, along with the game system," Kojima adds, "will be the 'ultimate masterpiece'." Just when you thought the designer had all he wanted to say with Metal Gear Solid, he starts talking up PW. If the game brings the epic quality of the home console to the portable console, gaming could very well be all the better for it. Eager to see if and how Kojima Productions pulls this off. Read Kotaku's impressions of the Metal Gear Solid: Peace Walker.